Do you ever think about light? I don’t mean things that aren’t heavy, I mean the shining goodness that comes from lightbulbs. Really the only time I’m pondering the wonder that is our electrical grid and its effects is when it’s vanished. Give me a good blackout and I’ll think about sweet luminosity all night. Seems some other people have a more visionary approach to light. Over at Timbuk2 they’re combining their knowledge of bags with the mission to help bring lighting to third-world countries at the 2009 Pop!Tech conference. 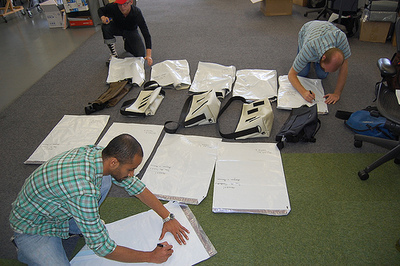 Their idea is to take a messenger bag and integrate a solar panel into the top, allowing people in Africa to use the bag by day and to power low-voltage lights at night. By simply extending useable light a few hours a day a family can be vastly more productive. Even Timbuk2 realizes that the idea might not work as well as expected, but every good idea has to start somewhere.